Cornelia Fogg Gallatin, daughter of the late Alex and Nannie Lee Fogg, was born in Louisburg, North Carolina on July 10, 1921. 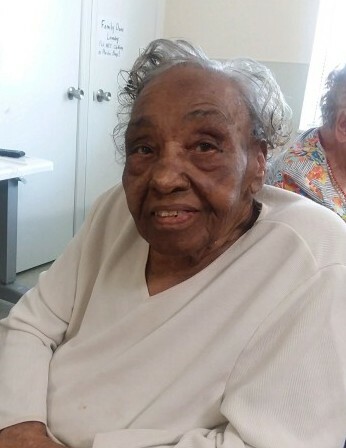 She departed this life on September 11, 2018 at Louisburg Nursing and Rehabilitation Center, Louisburg, North Carolina. Cornelia received her early education at the Walnut Grove School. About 1937, Cornelia married the late James Nathaniel Gallatin and to this union, five children were born. After marriage, she joined Nelson Chapel Missionary Baptist Church. Cornelia was preceded in death by her son, James Otis, her sister, Mary Bell Brodie and one brother, Alex Fogg, Jr..
She leaves to cherish her memory: her daughters, Rosa L. Clemons of Trumbull, CT, Lelia Jones (Johnny) of Bridgeport, CT, Martha Ann Evans of Louisburg, NC and Ernestine Covington of the home; her spiritual son, Silous “Button” Wilkins of Louisburg, NC; nine grandchildren; twenty-one great grandchildren; six great great grandchildren; two sisters, Alberta Davis of Louisburg, NC and Martha Cooke of Hyattsville, MD; one brother, Willie Fogg of Louisburg, NC; nieces, nephews, cousins, a host of other relatives and friends.